Sometimes, as a person who eats alone because you're a strong, independent, capable human who's just interested in having fun and focusing on your career right now and doesn't need a partner, OK? ?, you just don't want to cook enough food for a family of four, then eat the same thing for three days. So here are nine recipes that give you the exact ingredient proportions you need for a one-serving meal. Normally we'd balk at a crustless quiche, but cutting out carbs for the sake of a beach bod is still important even in the last days of summer. Quiche Lorraine is typically filled with bacon, ham, cheese, and cream though, so we're not actually that concerned about dieting. Check out the recipe here. Pesto is traditionally made with olive oil and nuts, but you can cut some serious cals by subbing in avocado (which will make it creamy but not greasy) and nutritional yeast. Garlic and basil round out this guiltless four-ingredient recipe here. One of the best things about cooking for yourself is that nobody's there to judge you when you only want to eat cheesy quesadillas for dinner. This spinach-loaded recipe is pretty dang healthy though so there's not much to be ashamed about. Get the skillet and get started here. All it takes to get the ideal amount of pasta for a single serving is a healthy handful of dry noodles. Add in shrimp, garlic, butter, white wine, Parmesan cheese, and a dash of chili flakes for a little heat! Find this recipe here. Pork chops and apples go supremely well together, which is why you shouldn't hesitate to sauté them at the same time you reduce the heavy cream, mustard, and thyme sauce. The mustard's acidity is crucial to balancing the dish. Get the recipe here. 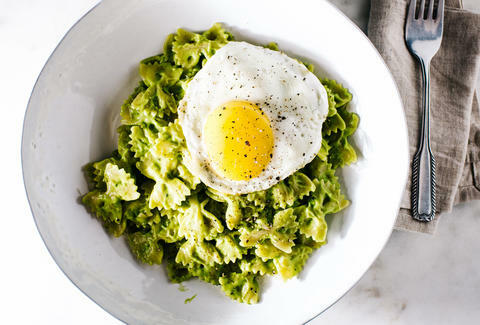 Avocado makes this farfalle pasta so creamy it’s almost comparable to mac & cheese. Almost. Add an egg on top for some protein and you have quite a balanced meal. Follow the recipe here. Exercise your freedom as an adult to eat ramen any damn time you please. This recipe is meant for one serving but can easily scale up to accommodate any number of morning guests. Recipe here. Skewer the kofta (meatballs) so they're easier to cook/look nicer on the plate. Just because you are eating alone doesn’t mean you can’t treat yourself to a meal with a restaurant-worthy presentation. Get that recipe! This bowl of healthy stuff is infinitely adaptable, but the gist is this: it's loaded with salty and satisfying Mediterranean flavors like feta, kalamata olives, and pepperoncini, plus a roasted red pepper sauce. Find the recipe here.